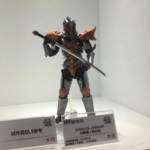 Tamashii Nations World Tour makes its next stop in Shanghai China, and a plethora of new S.H.Figuarts releases from Ultraman Orb have been revealed at the event, with photos courtesy of users from Weibo. Kicking us off, we have S.H.Figuarts Juggulus Juggler and Spacium Zeprion being the only two that have a confirmed price and release date: Juggulus Juggler will retail for 6500 yen slated to come out in January 2018, while Spacium Zeperion will come out in December for 5500 yen. It is unclear whether or not the pair will be mass retail release, or some exclusive to some site or storefront. 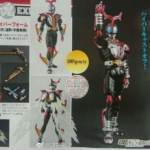 In addition, Ultraman Orb’s other forms: Burnmite, Hurricane Slash, and Thunder Breaster were also on display but with display only labels, so it is unclear if those three will ever see release to the public.